iPod nano (PRODUCT) RED is a special edition iPod nano which has all the features as with Apple iPod nano, the popular digital music player everywhere in the world. 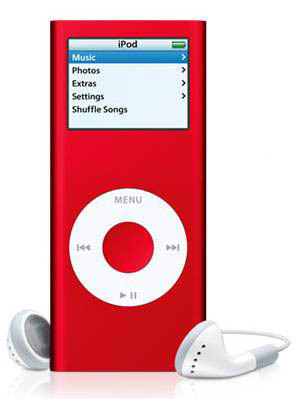 Except that Apple iPod nano (PRODUCT) RED is with a red exterior and has four gigabytes of flash storage space. As with iPod nano 2G (2nd generation), iPod nano (PRODUCT) RED features 1.5-inch color LCD display, up to 24 hours of battery life and seamless iTunes integration. Beside, when you purchase iPod nano (PRODUCT) RED, you’re doing your part in charity too, as Apple will donate $10 to Global Fund and (RED) to fight AIDS in Africa. Apple Matters reviews iPod Nano (PRODUCT) Red and concludes with rating of 8 out of 10 that for those that don’t have a large enough music collection to justify a purchase of the iPod, the Nano is definitely the next best thing. The size and weight are perfect for those who use their iPods in gyms or in sports (such as running or cycling). It’s also worth while noting that the 2G Nanos resemble the iPod Mini much more than the 1G, so if you were disappointed when Apple buried the Mini, then these newly re-mastered Nano’s could be the Christmas purchase/present for you.